Espen wasn't very old when I knew that there was going to be a "Cars" party in our future, although I resisted as long as I could. Lightning McQueen just isn't cute! And being the romantic that I am, I certainly wasn't about to go out and buy a readymade licensed trademark "Cars" birthday party kit to plaster all over my house. Last year I dodged the bullet by proposing a train birthday, which Espen loved to the point that he has requested that all future birthdays be train-themed. But the heart wants what it wants, and the only other real alternative that my opinionated birthday boy was interested in was Angry Birds (NO. ), and so I set about throwing a "Cars" birthday party. I had two fairly simple goals: 1) I wanted it to be charming, and 2) I wanted it to be fun for Espen and his guests. After a bit of thinking, I found the charm factor in Radiator Springs, the little town where the first "Cars" movie is set. It has a 1950's Americana feel that I have always thought was cute, so I decided to go from there. As for the fun part, I knew I would have room full of toddlers and pre-schoolers, so if we played our cards right, the fun would almost take care of itself. As in earlier years, I started out with the invitation. I like doing it that way to set the tone for the rest of the party. 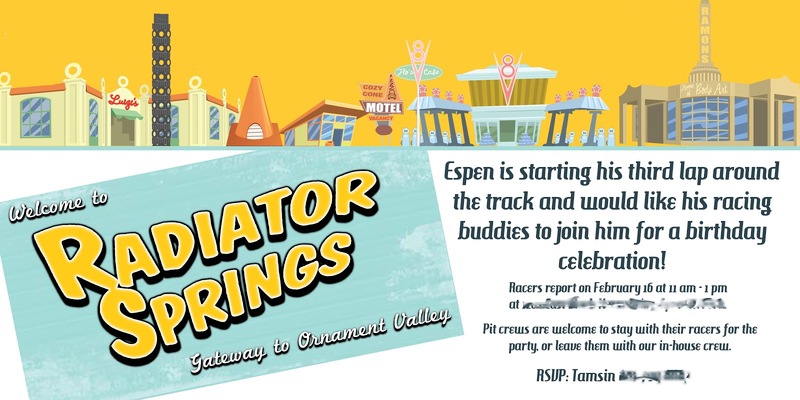 My good friend Kristen runs Sage Digital Designs, and was good enough to put together a pretty awesome custom invitation for Espen's "Cars" party. I've used her for several other occasions, including Espen's train party invitation last year, and can't recommend her highly enough. She's also (in my opinion) severely underpriced, so you are getting a steal for something custom. Pretty great, right? Cheesy wording by me. Once the invitation was sent out, I sat down to a serious Pinterest session and pulled together some ideas for the party itself. Then I conferred with Nick and scaled back about 2/3 of my ideas to something reasonable for a 2-hour party for a gang of mostly 3 year-olds. 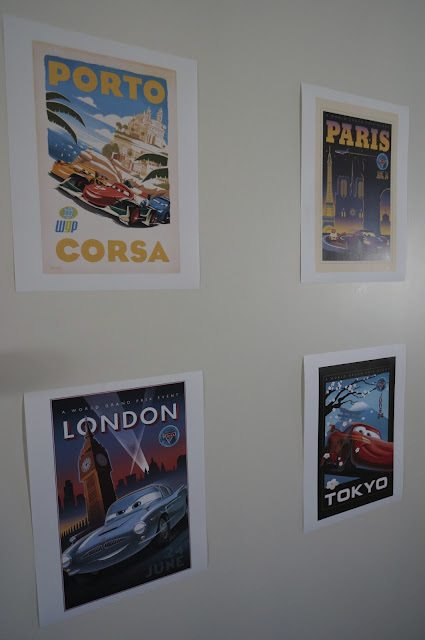 You can see my "Cars" Pinboard here, and find the origins for several of these ideas. 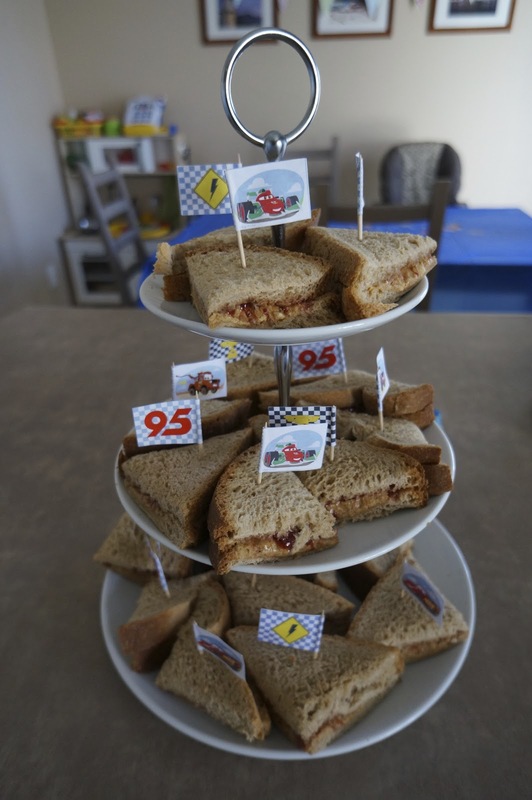 To let the guests know what to expect, we welcomed them with a Piston Cup "crest" and some racing flags on the front door. We found the Piston cup logo online and printed it on card stock, and found the cheapy racing flags at a party store. Everything is held together and attached to the door with tape, cleverly hidden by the logo. Super quick and easy, but quite impactful, I think. 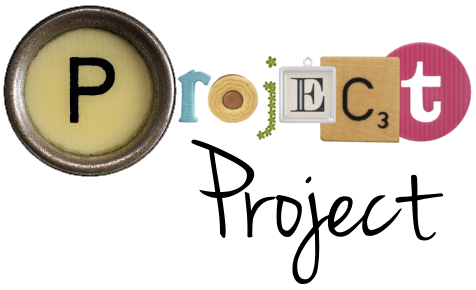 I especially love the vintage feel to the Piston Cup logo. Once inside, we had two main features in the living room that doubled as both decoration and entertainment. First, we made a road on the floor by cutting a black disposable table cloth in half and taping it down with white masking tape. 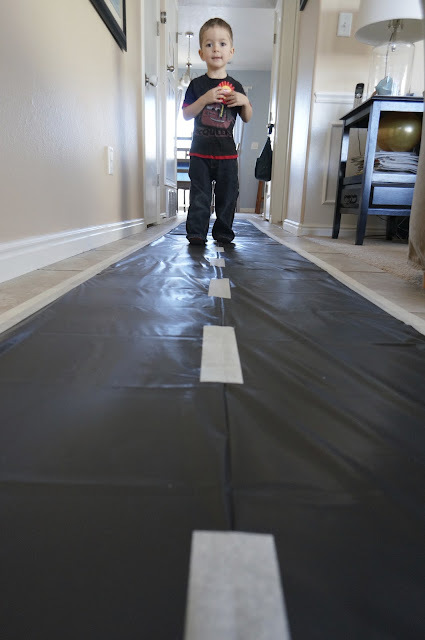 Then we put 12" strips of tape down the middle to separate into two lanes for "driving"/general mayhem. Definitely a hit with the kids, and very simple to do! It is similar to the train tracks we made last year, but much, much faster to set up and take down. When I say "we", I mean Nick. This was all him. The other thing we did in the living room was set up a car-driving area. Not a day passes without cars being driven all over our house, so we knew that a chance to play cars with his friends could not be missed. While looking around online, we stumbled upon this packing tape with a road design on it, and couldn't resist. Nick and Espen set up a road system on the floor and got out all of the "Cars" cars to drive on it. Finn McMissile and Holly Shiftwell take a spin. We also had a coloring station in the kitchen for kids who needed some quiet time (I've discovered this is a really great idea for kids parties), and when the party got really wild, we turned on the first "Cars" movie in the background so the kids could come and go as they pleased. There was always at least 1/3 of the kids watching the movie, which definitely took the edge off the craziness for the three adults in charge. Hanging these up (and rehanging them when they fell down) was almost the death of me. Proceed with caution. Some streamers. I got the checkered ones and the "Cars" themed ones at a party store, and filled out the gaps with some red and orange ones from our party box. He is definitely worth all the hoopla. Super simple Route 66 sign for the road on the floor, courtesy of Google Images. The photo's a bit dark, but you get the idea. And then I found and printed off these posters. We hung them in the hallway for the party, but they have since made it up to Espen's bedroom wall. He loves that they have his favorite characters on them, and I like the somewhat vintage styling. It's a pretty good compromise for a snobby mom like me. Speaking of compromise, as much as I didn't want a "Cars in a bag" style birthday, I knew that Espen would love to be part of planning and preparing for his party, so I took him party shopping with just the two of us and let him pick a few things, including the checkered flags and streamers I mentioned earlier. He very much wanted "Cars" themed party plates, so I conceded, and paired them with checkered napkins and red cups which I then let him decorate with "Cars" stickers. We also bought some "Cars" cupcake liners that we didn't end up using for the party, but we are sure to use them another day. And you can't really see it in the photos, but we also bought "Cars" confetti that we scattered on the kitchen table. And as has become traditional for our kid parties, we had balloons doubling as decorations and party favors. They look really festive, don't cost much, are fun to play with and don't have to kept forever after. And due to some miracle, none of the kids wanted the same color and everyone was happy. And I got to use my tiered plate! Peanut butter and jelly sandwiches. The sandwiches themselves were only moderately popular, but the kids went nuts over the little flags. They were a bit timeconsuming to make, but otherwise very easy. You can find them here. Again, a good combination of cute and charming for me, and Lightning McQueen encrusted for Espen and friends. Checkered rice crispy treats. We sort of invented these on the fly, but thought they turned out great. Basically you make a batch of plain rice crispy treats and put them in a square pan and let them cool in the fridge while you make up a second batch with Cocoa Krispies. Then you put the Cocoa Krispies on top of the plain rice crispies and let everything cool. Cut it into squares and alternate chocolate and plain side up to make a checkered flag. Super easy! Guido and the Tower of Tires. Not a great photo of these, but we also bought chocolate covered doughnuts and stacked them like car tires. I thought they tasted vile, but these were the absolute favorite treat. One little girl (who shall remain nameless) ate at least five of these! And finally, the birthday cake! We found a pretty genius tutorial for how to make a 3-shaped birthday cake using two bunt pans here, but be warned that it gives you a lot of cake. So much cake. We went with a checkered theme again, but you could also do a really cute road cake like this one here. I just couldn't face getting cute with fondant and frosting and wanted to keep things simple. Espen and his pint-sized guests. 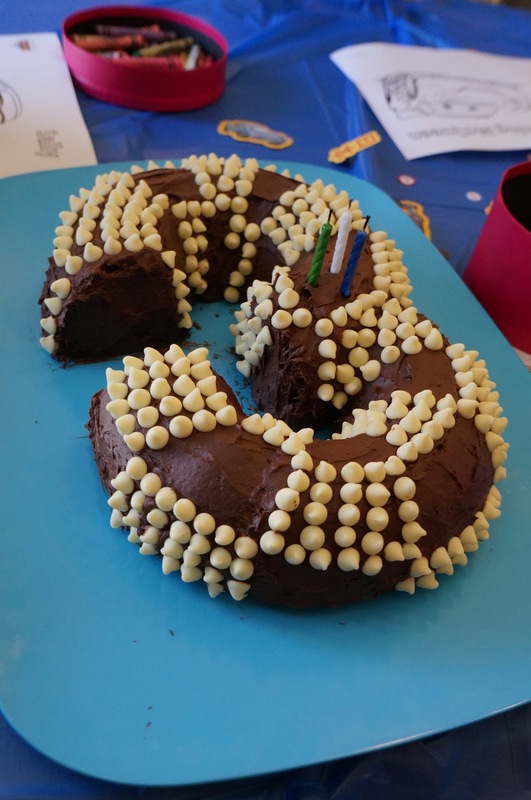 That was Espen's third birthday! Tiny people ran around screaming for two hours straight, we fed them sugar-laden food and refereed a few fists fights and everyone was happy, even if we couldn't move for about two hours after the last guest had left. And now we're off the hook until November when little miss Gwen gets her big day!